At Sunrise on October 13th 25 Marathoners started the first ever Escsalante Canyons Marathon. 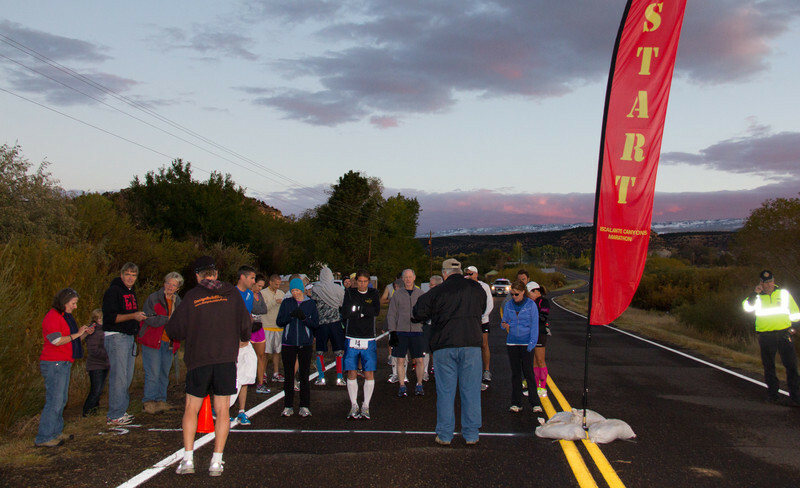 Starting in Boulder, Utah and finishing in Escalante this grueling course challenged each and every participant. The sunrise lit up Boulder Mountain, covered in snow from the previous days' weather, the 13th dawned pristine and beautiful. I had the opportunity to cover these amazing athletes. This morning was busy as the gun went off at 9:30 for the start of the 10 Mile race that started at the Head of the Rocks on Scenic Highway 12 and ended at the Escalante High School, the Finish Line for the Marathon as well. The scenery of the Grand-Staircase Escalante National Monument these Athletes got to enjoy during these races is unsurpassed anywhere, not just in our United States but I think the World. Here are images of the Athletes during this Pioneer Event.